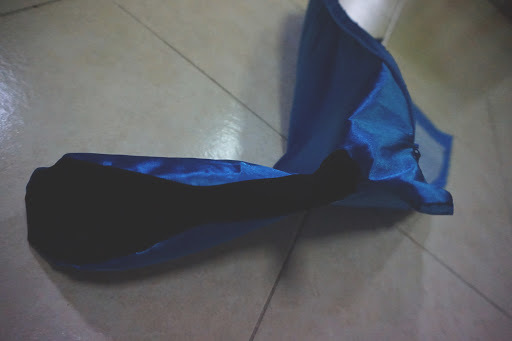 I previously covered how to make an easy shoe cover with stretchy cloth. 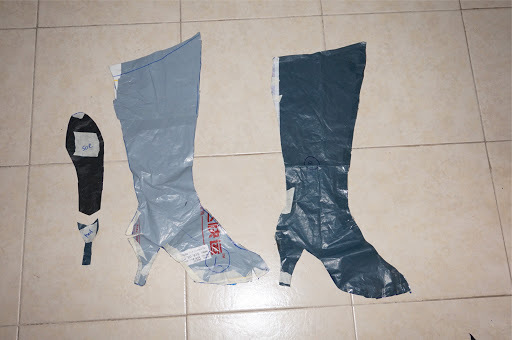 This time I'll share with everyone how to make knee high boots with non stretchy cloth. 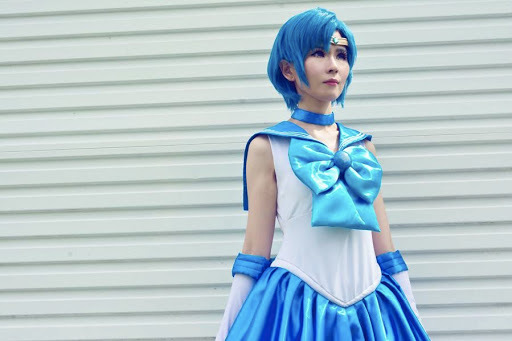 I used this particular method for my sailor mercury cosplay and I think it turned out pretty well! 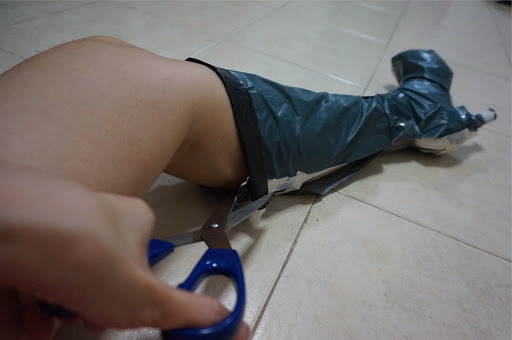 This method is suitable for boots that need to have a tighter fit and curve. 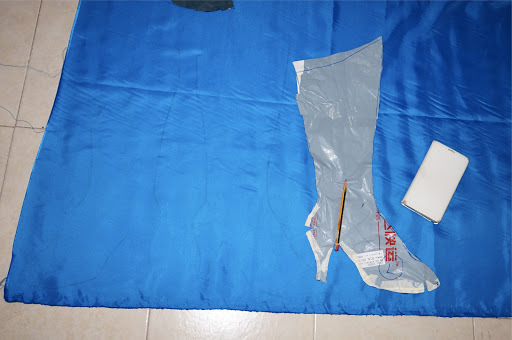 Trace the outline of your heels on a piece of paper, leaving enough space to continue the rest of the boots. In my example here though, i am using recycled plastic envelopes. 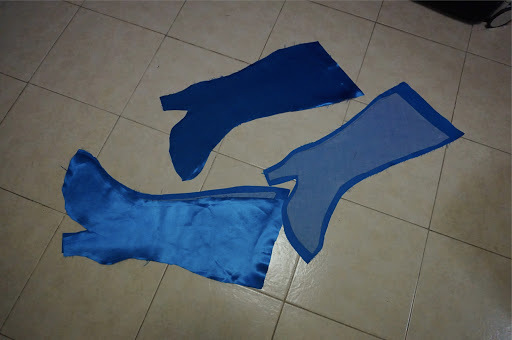 They are awesome because they are tear resistant which means I can continue to use these templates for other boots in the future. 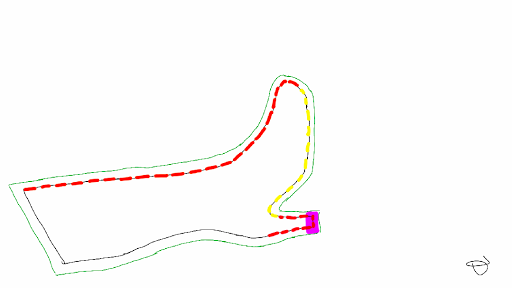 Due to the nature of our feet, the left and right pattern of our shoe will be slightly different. So remember to mark that clearly. 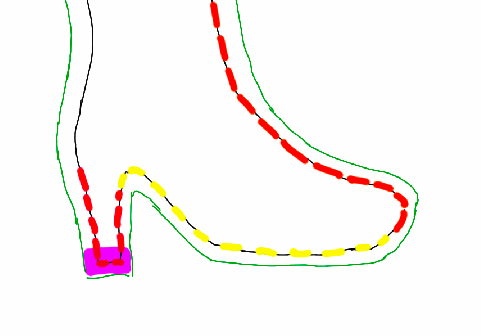 Also leave some allowance for the base of your heel, the siletto part. 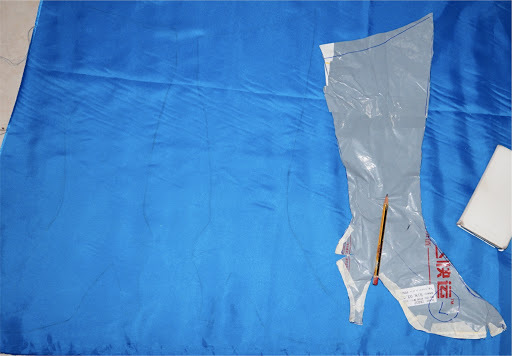 The purple part in the picture below falls 0.5 cm lower than the sole area because this part will be underneath your heel. It will be the portion that your heel steps on, I hope this makes sense ! 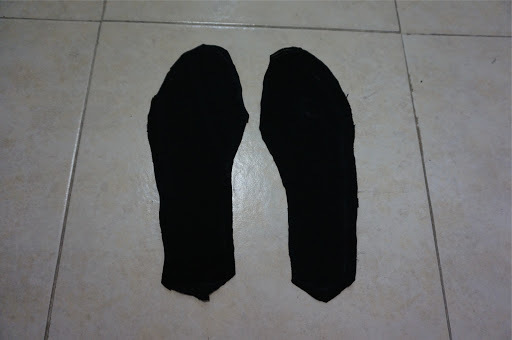 Also trace the sole of your shoe. A preview of the end template. 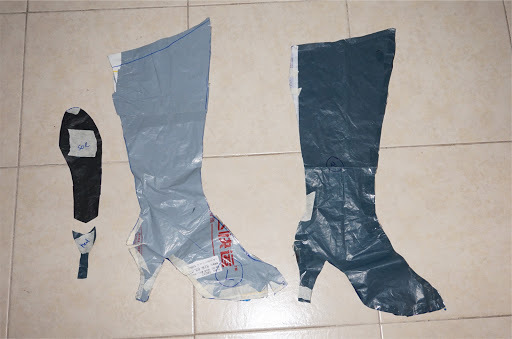 Left and right side of the boots, plus the sole and heel. 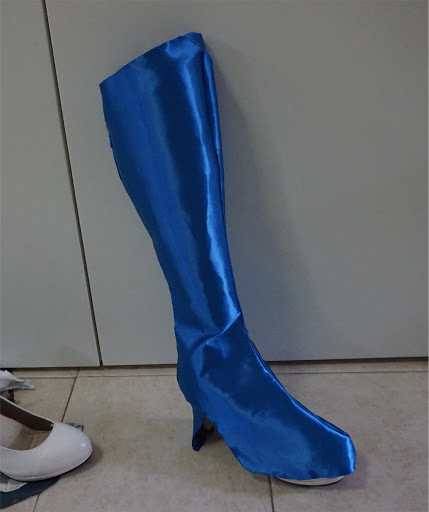 However for this boot cover, I did not do anything special for the heel area because the heel is thin enough to be wrapped with just the fabric so you can ignore that template for now. This part gets a little more test and trial. 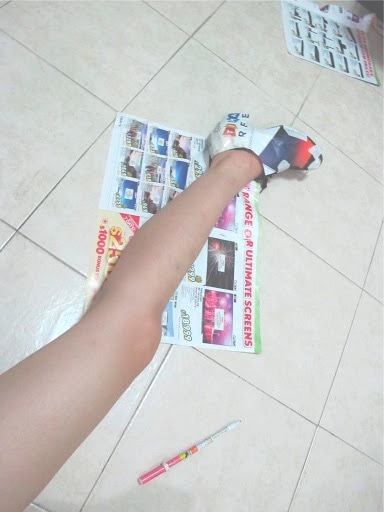 Here we will extend the drawing to include the calves all the way to the knee. You can either use a measuring tape to measure the circumference of your calves and do some math to deduce the shape and size. 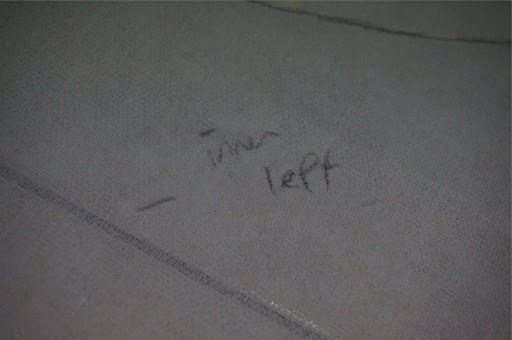 Or place your legs on top of the paper and trace around it. Either way, this is roughly the shape you should get. Leave yourself some comfortable allowance (just in case) and then cut both pieces out. Now it's time to test the template! 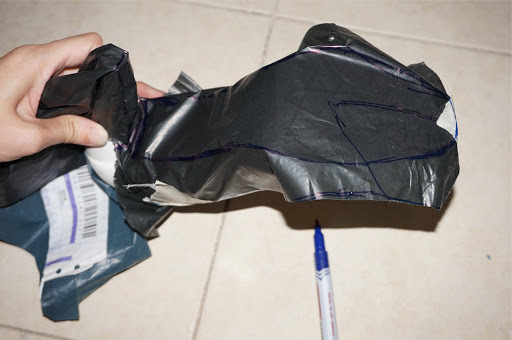 Just tape the front seam and heel area together first and test on your heels. Does it fit the heels well? Too big? Just fold the extras away and tape it down. Too small? Just let your masking tape fill up the gap. 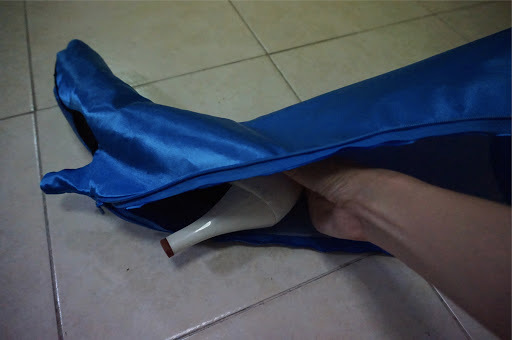 Then you can try fitting your feet into the template and heels because when your feet goes in, there will be much lesser space than you think. 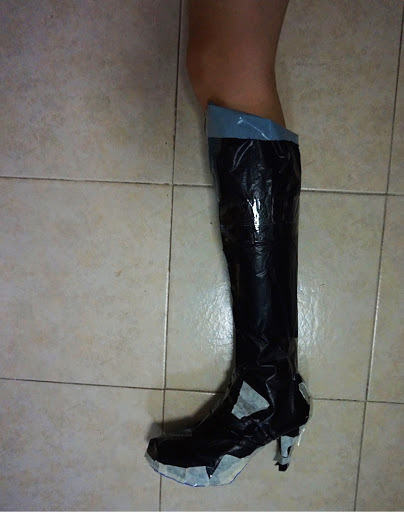 Next , tape up the entire template and see if everything fits your calf. 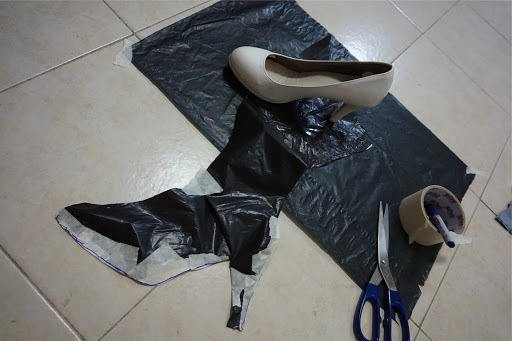 You can use a masking tape to temporarily tape the template down onto the bottom of the heels to get a more accurate fit. If everything turns out fine then cut the template a part with a pair of scissor right through the centre. Then flatten and cut the template into 2 sides. You should end up with these few templates. Transfer the template onto your fabric. 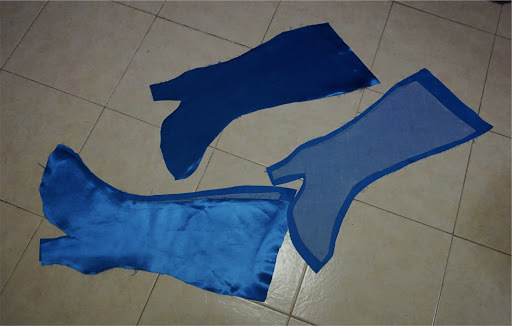 Make 2 sets of both the right and left boot but make sure to flip the template over when you are cutting for the opposite leg. 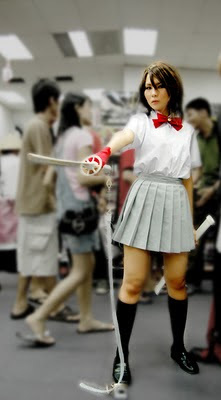 Remember to give enough allowance for the seams. Especially so for the back where you need to sew the zip later. 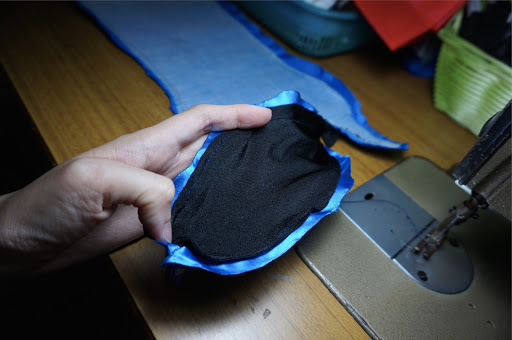 Do the same for your soft interfacing. Leave around 3mm allowance for the interface. 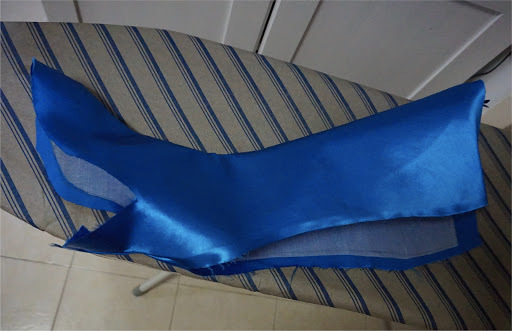 Now iron the soft interfacing onto the wrong side of your fabric. 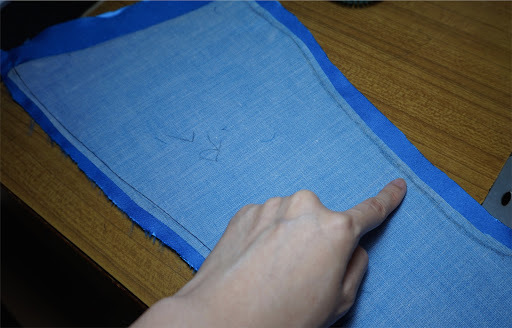 Try to match the seam lines of the fabric with the interface. Now sew the pieces together inside out along the red dotted lines. 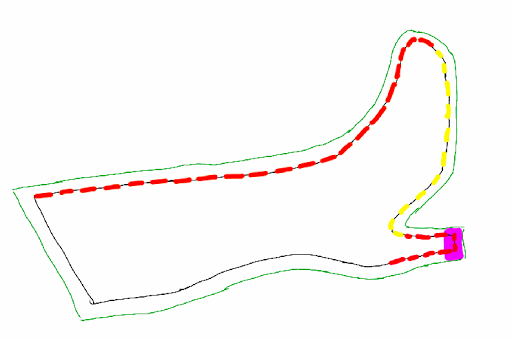 Leave the yellow dotted line alone for now. 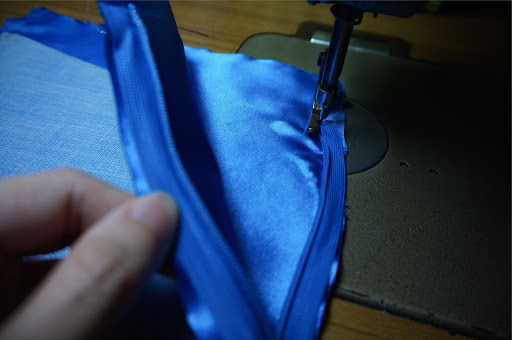 When you sew the seams, you will be sewing through the interfaces and the fabrics. 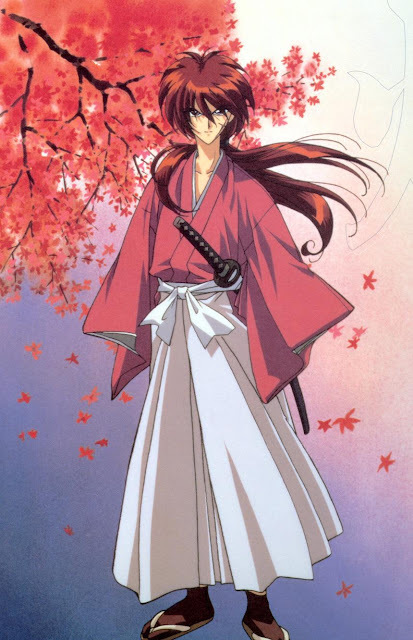 It is essential you do that because the interface is the one that will hold the structure of the entire boots. 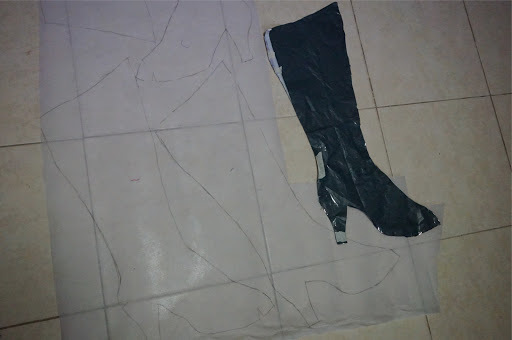 By sewing it through with the fabric, you create a skeleton to hold the entire boots in. 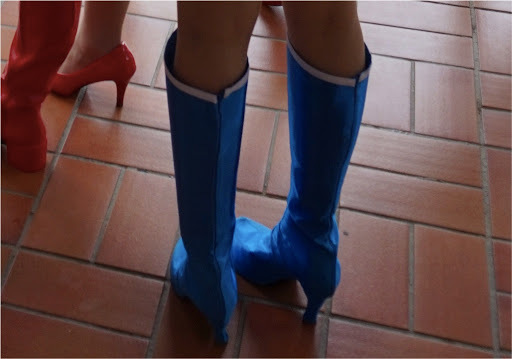 Turn the boots cover inside out and test it on your heels. Make sure everything fit. 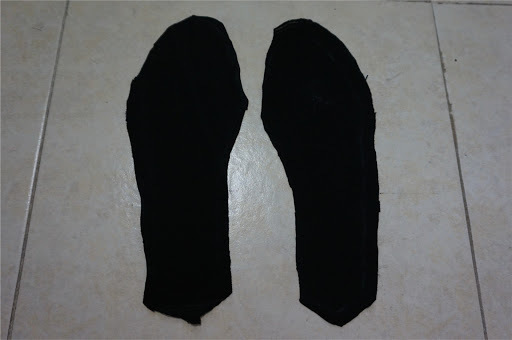 Cut 2 piece of black stretchy and strong fabric based on the template of your sole. Remember to leave some allowance. 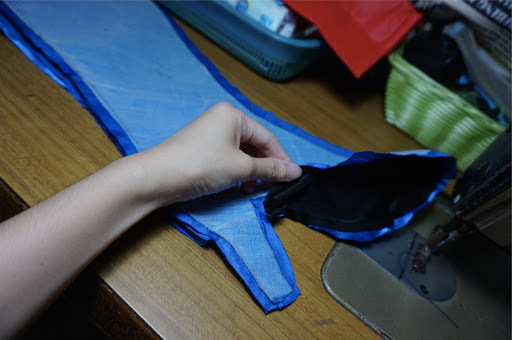 Sew the conceal zip onto the back of the boot cover and sew the extra allowance on top down. In the photo below, I was doing a reverse stitch to lock the stitches down. You’re not supposed to use that foot this way (stepping on the zip). 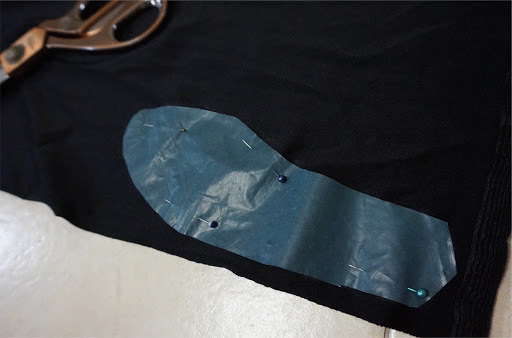 Turn the boot cover inside out and sew the black stretchy cloth onto the base along the yellow dotted line ( * refer to step 6 ). 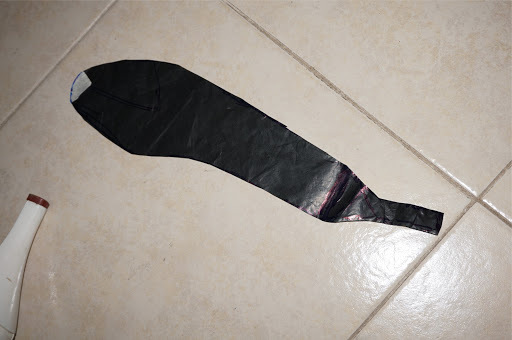 You might not be able to fully sew the end of your black lycra but it's ok to just leave it. After you are done, turn it inside out and try it on the heel again. Also, remember to iron the entire boot cover after you are done. 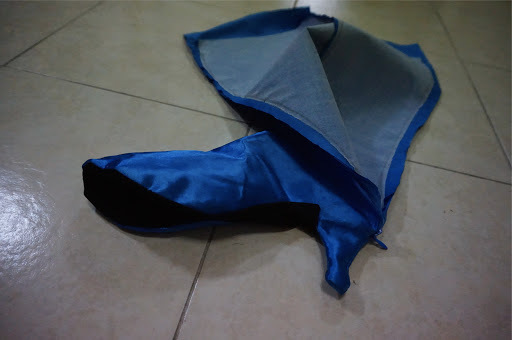 Neatly ironed boot cover along with the interfacing looks so much nicer ! And try not to crease it while transporting/wearing though it is inevitable haha. Hope you guys found this tutorial helpful! 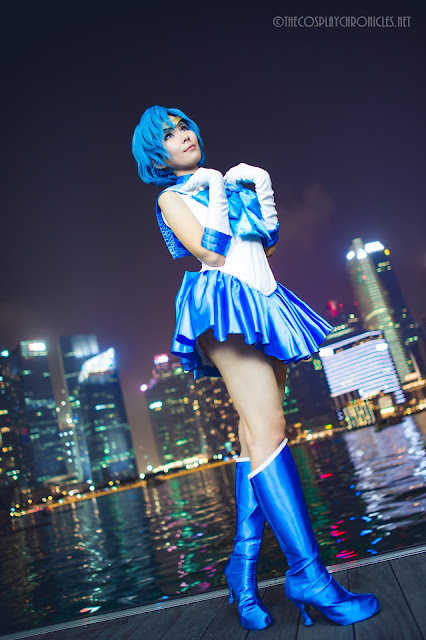 Remember to comment and share this tutorial to other friends who might like it ^_^. I tried to explain as best as I could, hopefully I didn’t missed anything!